Pieced Brain: Strip Quilt: quick, easy, and fun! Strip Quilt: quick, easy, and fun! Here is my latest finish still on my design wall, waiting for a hanging sleeve. The name of this quilt is Teenagers in our House - see if you can guess why! I had fun making this quilt using 2 1/2" strips left over from a queen-size quilt I made for my son's wedding (see it here). It is an adaptation of a quilt I found in a book I received for review: "Strip Savvy - 2 1/2"-Strip Quilting Designs" by Kate Henderson. Photo by Brent Kane for Martingale. 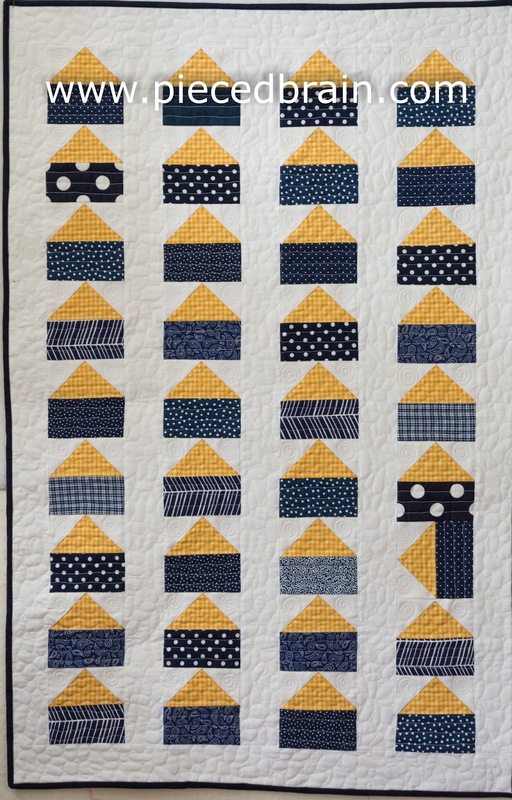 Kate Henderson presents fun ideas on how to use up pre-cuts or leftover strips, turning them into amazing quilts which are quickly put together and sure to please everyone. Her 18 inspiring modern designs will get you running to your stash, as I did to mine. I especially appreciated her innovative techniques for constructing traditional blocks, something I always look for to ease and speed up my projects. What, with only two hands and hundreds of quilts I want to make, I need help! I read the General Instructions section carefully and got many tips for improving my quilting experience. The pattern instructions are clear, with lots of diagrams to ensure we understand the process. Photos by Brent Kane for Martingale. Do you see what I mean? These are my favorites. The quilt on the right, "Little Houses", is the one which made me put the book down and start working. I opted for orienting my little houses in one direction and making the roofs all the same color. This wall hanging measures 40 3/4" by 26 3/4", was pieced with Aurifil threads, and quilted with Isacord polyester thread. Freemotion quilted on my Bernina, and the binding was hand sewn. "Inspiration", in my dictionary, is the spark 'something' causes in my brain to make me run to my studio as fast as possible and start working. Books provide lots of it, and Strip Savvy did the trick for me this time. I love your version! I love the colours and the house on its side! Great house quilt! I love the one the sideways one.